Cutting out hearts that will evolve into narrative Valentine cards. Sanding...filing...sanding...filing...burnishing...filing...repeat. Hi Bobi! 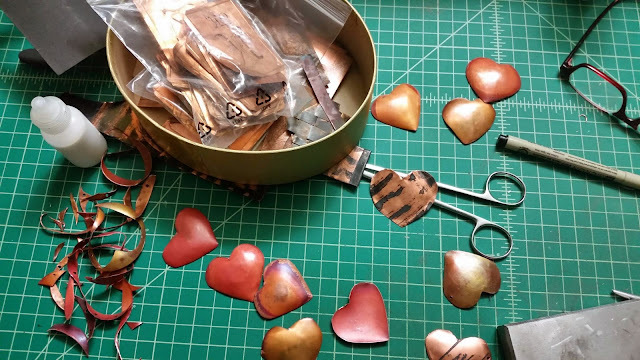 Will all of these wonderful copper works hearts going to be for sale at DS Watkin's studio over First Thursday Art Walk in downtown Kennewick for February? So creative! Love these little hearts. I still have one from the last time you made these. I think Deborah will have a lovely show there with all the wonderful cards I'm seeing people create. Why yes, Patti - they will be available at DS Watkin's Studio (AKA Turtledove Press) this coming First Thursday! Laura - I didn't know you got one. Which one? Bobi, they may have been a bit different. Last time Deb had the valentines' card show, you had a few cards that had thin copper patina-ed heart pins on them. Thats the one that i have.